In addition to introducing the III-V alloy LED, Holonyak holds 41 patents. His other inventions include the red-light semiconductor laser, usually called the laser diode (used in CD and DVD players and cell phones) and the shorted emitter p-n-p-n switch (used in light dimmers and power tools). In 2006, the American Institute of Physics decided on the five most important papers in each of its journals since it was founded 75 years ago. Two of these five papers, in the journal Applied Physics Letters, were co-authored by Holonyak. 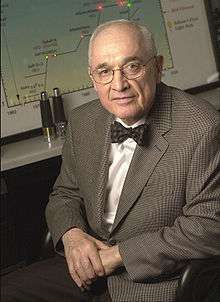 The first one, coauthored with S. F. Bevacqua in 1962, announced the creation of the first visible-light LED. The second, co-authored primarily with Milton Feng in 2005, announced the creation of a transistor laser that can operate at room temperatures. Holonyak predicted that his LEDs would replace the incandescent light bulb of Thomas Edison in the February 1963 issue of Reader's Digest, and as LEDs improve in quality and efficiency they are gradually replacing incandescents as the bulb of choice. Holonyak's parents were Rusyn immigrants who settled in Southern Illinois; Holonyak's father worked in a coal mine. Holonyak was the first member of his family to receive any type of formal schooling. He once worked 30 straight hours on the Illinois Central Railroad before realizing that a life of hard labor was not what he wanted and he'd prefer to go to school instead. According to Knight Ridder, "The cheap and reliable semiconductor lasers critical to DVD players, bar code readers and scores of other devices owe their existence in some small way to the demanding workload thrust upon Downstate railroad crews decades ago." 1 2 Wolinsky, Howard (February 5, 2005). "U. of I. 's Holonyak out to take some of Edison's luster". The Chicago Sun-Times. Retrieved 2015-01-17. ↑ Damery, Jonathan (August 5, 2013). "Holonyak retires after 50 years in ECE". University of Illinois. 1 2 3 4 Port, Otis (May 23, 2005). "Nick Holonyak: He Saw The Lights". Business Week. Retrieved 2015-01-17. ↑ Von, Jon (January 25, 2003). "Nice Guys Can Finish As Geniuses at University of Illinois in Urbana-Champaign". Chicago Tribune. Retrieved 2015-01-17. ↑ "Nicholas Holonyak Jr.". IEEE Global History Network. IEEE. Retrieved 2015-01-17. ↑ Recipient list of NAS Award for the Industrial Application of Science winners. ↑ "Holonyak Historical Marker Unveiled". University of Illinois College of Engineering. 2007-11-15. Retrieved 2007-11-30. The Bright Stuff: The LED and Nick Holonyak's fantastic trail of innovation. Laura Schmitt. 2012.